Travel Guide to Visiting Iceland. Iceland is one of the most magical countries that you'll ever visit. From unassuming volcanos and rushing waterfalls to majestic glaciers and the stunning Northern Lights, there is something for everyone. The popularity of the Land of Fire and Ice has exploded in the past few years as the country has fully embraced tourism and has quickly become a bucket list destination for many travelers. With great airfare deals, a close proximity to both the United States and Europe, and stunning cinematic landscapes, Iceland should definitely be on your travel list. Today, I'm sharing my top tips and sights to see when visiting, and why you should make the gorgeous country of Iceland your next big getaway! I've visited Iceland twice now and am still amazed by how much there is left to do. The Icelandic experience is unlike that of any other country. Here are just a handful of the many experiences I would recommend while visiting Iceland. Rent a car and get your drive on. One of the best ways to see all of the beautiful sights that Iceland has to offer is by driving through the countryside yourself. Because most of Iceland's attractions are free, it's well worth the money, freedom, and flexibility to go the rental route. Go ahead and roll down your windows while you're driving and breathe in the crisp clean air. It will make you look at the country in an entirely different way! Lagoon Car Rental is my absolute go-to when I'm in Iceland. The staff of this family-owned company is incredibly helpful and is the perfect example of Icelandic hospitality. When you land in Iceland, one of their employees will meet you in the arrival hall and will drive you to their office, which is 5 minutes away from the airport. Enjoy a free coffee or tea as their team walks you through the rental process. The staff will even give you a pass for 10% off at specific gas stations. Trust me, with the prices of gas at roughly $8 a gallon, you'll be grateful for the discount. Get a Reykjavik City Card. The Reykjavík City Card is the easiest and most affordable way to experience the capitol. The card gives free access to all city museums and galleries, the Reykjavík Family Park and Zoo, public transportation, the seven geothermal pools in the capital area, and other activities throughout the city. You'll also get discounts at various restaurants, shops and cafés, and tours within Reykjavík. At the time of this post, 1 USD is equivalent to 102.84 Icelandic Króna, making the pricing for adults 3700 ISK (approximately $37) for 24 hours, 4900 (approximately $49) ISK for 48 hours, and 5900 ISK (approximately $59) for 72 hours. The pricing for children between the ages of 6 and 18 is 1500 ISK (approximately $15) for 24 hours, 2500 ISK (approximately $25) for 48 hours, and 3300 ISK (approximately $33) for 72 hours. If you go to just two museums, the card pays for itself! Even if you're planning on renting a car, Iceland is a country where visitors can really benefit from large group tours. Most tours will pick you up from your accommodations and also drop you off, which also takes some of the hassle out of navigating the streets. This is highly recommended if you are going on a brewery tour or if you plan on partaking in an activity that you may not have experience in or require equipment for like glacier climbing or riding an ATV through lava fields. Attractions like the Golden Circle would be likely better experienced in a car if you have one available and are going with a group as you'll be able to stop whenever and wherever you want. Price is approximately $200 depending on the tour (3-4 hours). This option is definitely a phenomenal way to explore the Icelandic landscape. Learn the basics of riding a horse and get going along the countryside for a truly unforgettable experience (and an amazing Instagram photo, of course). Price starts at $100 typically depending on the tour (2-4 hours). Iceland has become the whale watching centre of Europe. I would highly recommend a whale watching tour for an unforgettable experience One of the options that I loved is through Reykjavík Sailors. If you're hugely into animals, visit Whales of Iceland in the heart of Reykjavík's harbor area, the newest and largest year-round whale exhibition in Europe. Lay Back in a Geothermal Spring. Feel like a local by following the Icelandic tradition of bathing outdoors. These springs are always a highlight of any trip to Iceland. Flex Your Muscles While Glacier Walking and Glacier Climbing. This is one of the instances that you absolutely need a tour guide for. The elements change quickly in Iceland, and it's essential in the winter to have an experienced guide to lead the way, and provide crampons, ice axes, and equipment, etc. Kolaportið is Icelenad's only flea market and is a great place to uncover hidden gems. It's open Friday through Sunday from 11am to 5pm and is located in the heart of downtown Reykjavík. One of the absolute best things about Iceland? All of the natural places to visit are free! Here are some of my favorite places to visit. Vikurbraut, Vik 870, Iceland (Free if driving, tour prices vary, 2-3 hours). You'll fall in love with the basalt columns on the Black Sand Beach at Reynisfjara. The beauty of the cliffs, rock formations and the contrast of the black sand and white foam are everything. Pro tip: Don't turn your back on the waves - they can be very unpredictable. 240, Grindavik 240 (Starts at 6100 ISK - About $60 - for the standard package). Easily the most popular tourist activity in Iceland, you won't want to miss the Blue Lagoon. Iceland's foremost geothermal spa was named one of National Geographic's “25 Wonders of the World" and is located in a black lava field just off the highway linking Reykjavík to the Keflavík International Airport. The geothermal water is typically 37-40°C (98-104°F) and is especially amazing on a cold day because you can see clouds of steam rising from the teal water and evaporating into the air. The water of this man-made lagoon flows from a nearby geothermal power plant and self-cleanses every 40 hours. The Blue Lagoon's water features three active ingredients – silica, algae and minerals - which are phenomenal for your skin, but awful for your hair. Long-haired ladies, do not for the love of all that is holy dip your hair into the water. The Blue Lagoon's water will make your mane feel brittle and dry for at least a week otherwise. Make sure to slather your hair in the free conditioner from the shower and tie it in a top knot to protect it. Book your ticket in advance or your may not get in! There are often cancellations so you may still be able to get in even if the online reservation systems says that the tickets are sold out - book early to be on the safe side. Be prepared to completely strip down and shower before heading into the lagoon. This is a must in Iceland and you will get dirty looks if you attempt to shower with your swimsuit on. There are private stalls if you're feeling shy though. Many visitors book a ticket to the Blue Lagoon on their way to or from KEF since it is close in proximity. That being said (or written), if you have luggage with you, you can leave it at the luggage storage section near the parking lot. The cost is 550 ISK (approximately $5) per bag. There are also small free lockers for luggage inside the lagoon. Pro tips: There is a passage from the spa to the lagoon so you don't have to run in the freezing cold to the water. Also, make sure to bring your bathing suit and towel or else you will be charged a fee. First stop: Geysir - Haukadalsvegur, Geysir. Second stop: Gulfoss Waterfall - White River, Blaskogabyggd 801. Third stop: Thingvellir National Park - Thingvellir. (Free if driving, tour prices vary, Daylong activity). The Golden Circle is a scenic daylong driving route that consists of three sights through southwestern Iceland that most tourists love to visit. Some recommend taking a guided tour, but you could also easily do this drive on your own if you have a rental car. This also leaves more room for detours, which are often the most fun part of traveling. The first stop is Strokkur (also known as the Geysir) and the Valley of the Haukadalur. Enjoy lunch here at one of the handful of restaurants and pick up a souvenir or two before a short hike to the top of the mountain for a great view of the erupting geysers. The Strokkur geyser erupts every 5 to 10 minutes. This is followed by the Gullfoss waterfalls. The third stop is Thingvellir National Park, the site of the 1,000 year old parliament and also the home of the Continental Divide. Standing on the junction of the North American and Eurasian tectonic plates as they are pulled apart at a rate of 1mm to 18mm per year. Harpa Concert Hall and Conference Centre. Austurbakki 2, Reykjavík 101 (Free - unless there is an event or exhibition, 1 hour). The HARPA concert hall and conference centre features a gorgeous colored glass facade inspired by the Northern Lights and designed by renowned visual artist Olafur Eliasson. Downtown Reykjavík (Also known by its postal code as 101). Laugavegur, 105 Reykjavík (Free, 3-4 hours or more). Say hello to Reykjavik's hippest street also known as "Wash Road'. The street gets its name because it was once the street Icelanders used to visit the hot springs where they washed their clothes. While it's unlikely you'd stumble upon a place for your laundry on the street now, Laugavegur has become famous for its restaurants, bars and cafes. Skaftafell National Park on Route 1, Jokulsarlon (Free, 1-3 hours). This beautiful bay is full of icebergs and almost a sense of magic. It truly feels like time stops when you're here. Try to get there early to avoid the crowds and enjoy a serene moment to yourself. Seljalandsfoss, South Iceland (Free if driving, tour prices vary, 1-2 hours). Seljalandsfoss is one of the most well-known waterfalls in Iceland and is a must-see, especially because you can walk a path behind the waterfall during the summer months. Bring a raincoat and rainboots if you plan on going behind the falls or else you'll end up drenched. A wet traveler is often an unhappy one! This nearly 200 foot waterfall is close to the main Ring Road at the base of the Eyjafjallajökull Glacier. Skógar, South Iceland (Free if driving, tour prices vary, 1-2 hours). Location varies (Free if driving, tour prices vary, 3-5 hours). Seeing the Northern Lights in person is one of the most surreal experiences and Iceland is one of a very small handful of places in the world where you can see the natural phenomenon. The lights are dependent on the weather and time of year, so there is no guarantee of seeing them. However, tours will likely give you a better chance of seeing the lights. The Northern Lights Mystery Tour takes you out of the city lights into the countryside and is highly recommended. To see the Northern Lights, you’ll need dark and partly clear skies. The clearer the better! While tours do not guarantee sightings, most will often book you another tour free of charge if you don't see the lights. Vik, Iceland (Free if driving, tour prices vary, 1-2 hours). Sólheimajökull is an outlet glacier of Mýrdalsjökull, one of the biggest glaciers in all of Europe. This glacier is retreating every year, so it's humbling to see the glacier in person and a privilege to be able to enjoy them while they're still here. It’s only about a 10 to 15 minute from the parking lot and it’s an easy walk overall. There's also hot food, drinks and a bathroom in the parking lot. You don't necessarily need a guide to see the glacier. If you're looking to climb the glacier, you will 100% need a guide though. Troll Expeditions' Ice Climbing and Glacier Walk is well worth it! The guide sets you up a climbing rope and will teach you how to ascend a vertical wall using ice axes and crampons. This depends on the time of year you're visiting. As a rule of thumb, pack plenty of layers just in case. Summer and spring are beautiful and rarely require more than a light jacket, while it's essential to bundle up in the winter due to the freezing cold temperatures. Iceland is one of the rare countries where I would recommend packing more than you think you may need, because it can be so expensive to pick up miscellaneous items. For example, a Maybelline mascara that normally would cost less than $6 in the United States was over $25 in Iceland. A pair of waterproof pants from North Face also cost me a pretty penny at $140 overseas, while they would have been less than a third of the price in New York City. Bathing suit. You'll need one for the Blue Lagoon and relaxing in a geothermal pool. Flip flops. You'll be grateful for them when you're wading your way out of the water or dipping your feet into a spring. Long johns or thermals during winter. The temperatures drop substantially in the colder months and you'll be grateful for more layers. After all, who has time to get sick when they're traveling? Having to choose between seeing the Northern Lights and staying in bed nursing a cold is the last thing you want to do when you're in Iceland. Reusable water bottle. Iceland's water is amazing and there's no need to buy bottled water. Water straight from the tap is delicious! Snow shoes or sturdy walking shoes. If you're planning on exploring nature, these shoes will make all of the difference. Ski socks during winter. The cold can be bitter and you'll regret not having warmer layers otherwise. Thick winter coat. This is essential in the colder months! A trip to Crossroads Trading Co. is definitely in order before your trip as they specialize in name-brand and designer clothing at amazing prices. I stocked up on two new coats for less than $30 a piece so I could swap them out when the other was drying. Towel. There are no words for how grateful you'll be to have one with you whether you're coming out of a natural hot spring or heading into the car after being drenched by a waterfall. The Blue Lagoon and some pools will also charge you to rent a towel. Waterproof pants. These will be your go-to when hiking behind waterfalls or walking along glaciers. These were easily one of the best investments from my trip to Iceland. The fresh ingredients and Nordic simplicity of Icelandic food are simply beyond reproach. Icelanders definitely know how to eat! Vegan and vegetarian options are expanding quickly thanks to world-class chefs and restaurants, so there is something for everyone. This dark bread is slightly sweet and is usually eaten with butter or with smoked lamb or fish. These lamb-based hotdogs are covered in ketchup, mustard, fried and raw onion and remoulade. One of my favorite places in Iceland's capital to grab one is Bæjarins Beztu Pylsur (Tryggvagata 1, Reykjavík 101), which translates from Icelandic into English as "the best hotdog in town." It is located across the harbor at the end of Laugavegur so it's a great place to stop after some shopping. Icelanders will tell you that their lamb is some of the best. Let's just say that they're not exaggerating! Iceland's lamb is ultra-tender and incredibly delicious. This traditional Icelandic meat is a staple on most menus especially in a traditional Icelandic meat soup. This hearty and popular meal is made from potatoes, carrots, rice, and lamb. It's especially perfect on a cold, winter day. If you're planning on going on a glacier walk or a long hike, a bowl of Iceland's meat stew will have you feeling happy and full in no time. The seafood in Iceland is simply phenomenal and is some of the freshest you'll ever have, as fish is the country's greatest export. The Arctic waters are full of cod, herring, skate, lobster, and salmon. Let's just say that the sushi is out of this world! You'll fall in love with this rich and creamy no-fat dairy product. Skyr is full of protein and is known as the Icelandic superfood. You'll definitely want to eat it every day during your travels. Looking for a charming place in a great location? The Alda Hotel is located on Laugavegur within walking distance of tons of restaurants, bars and shops. There is also a sauna, hot tub, and fitness center. The staff is friendly and helpful! Hlemmur Square is a combination boutique hotel and hostel and is right in the heart of the city centre. The hotel is located on the 5th floor and has 18 rooms, most of which that have a private balcony. The dormitory-style hostel is located on the third and fourth floor and is a great affordable option for travelers on a budget. There is also a bar on the first floor, which makes meeting new people or catching up over a drink much more convenient! This rustic Hotel Glymur offers six beautiful villas, each with their own hot tub. 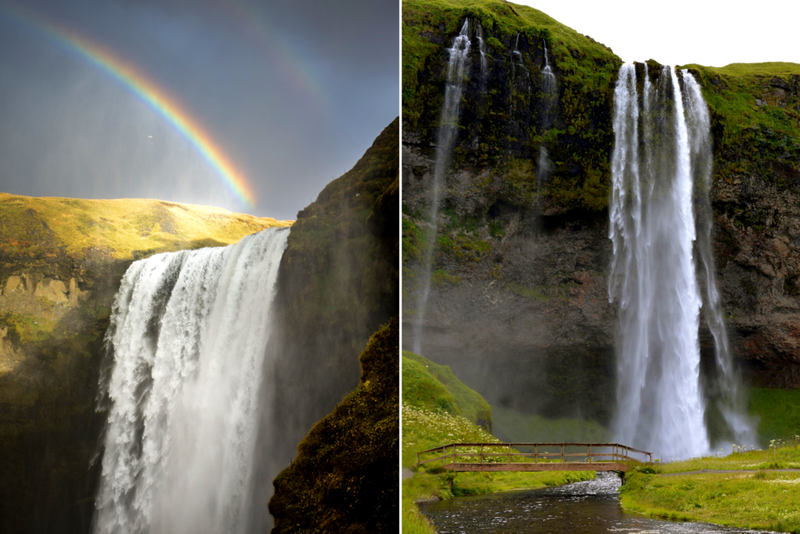 The hotel gets bonus points because it's located near the Glymur waterfall. Nesjavollum vid Thingvallavatn, Selfoss 801. Book a room at the Ion Adventure Hotel for a luxurious experience. This modern building is surrounded by lava fields and snow-capped mountains. Icelandic Króna is the currency. At the time of this post, 1 USD is equivalent to 102.84 Icelandic Króna. Credit cards definitely reign supreme and are accepted nearly everywhere you go on the island, so carrying a large amount of Króna isn't necessary. If you feel more comfortable having a little cash on hand, use the ATM at the KEF airport to pull out 2000 ISK (approximately $20 worth) to be safe. You won't need more than that! Tipping in Iceland is also not expected as service is already factored into the cost. Most items have to be imported into Iceland since it is an Iceland, so be prepared to spend a little more on meals than you normally would.Visit Bónus and Krónan to pick up groceries. You only need a passport to visit. No Visa necessary for Americans and most other countries. Have you visited Iceland before? What tips and tricks would you recommend? Seven Reasons to Visit Iceland. What to Pack for a Trip to Iceland.